Nowadays, it seems like everyone and their brother has a blog. It's the perfect way to express yourself or share the knowledge or point of view that you have. Being the graphic designer that I am, I am a very visual person. I have been guilty, on more than one occasion, of leaving a blog because I don't find it ascetically pleasing. I do this with websites too. A company can have a good reputation, sell amazing products, etc., but if I go to their website and it's ill organized or not pleasing to the eye? Well, I quickly exit and move on. I know that may sound kind of shallow, but come on people. There are a million and one little tweaks that can be made - for free - so, I find there really is no excuse! 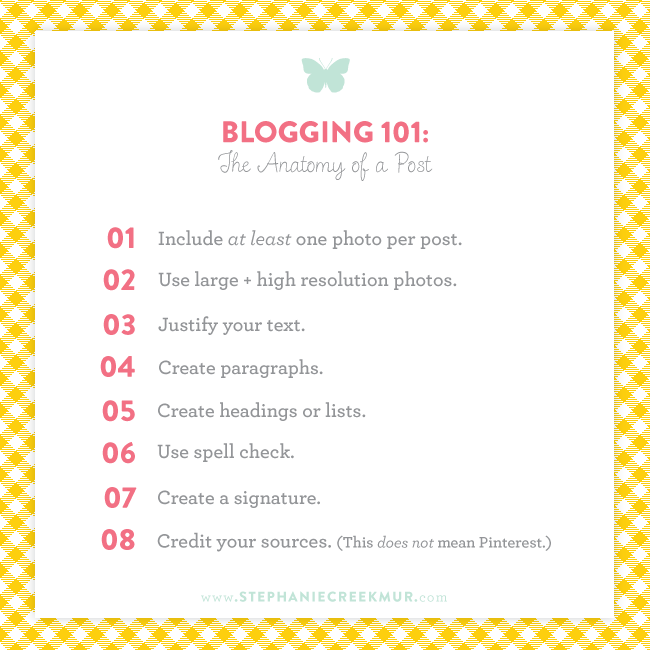 With that being said, here are just a few tips to make each of your blog posts a little more appealing to the eye. 01 | Include at least one photo per post. People are extremely visual beings and including a coordinating photo really adds to the overall feel of your post. This also means that the photo has to be related in some way - as in, don't post a picture of your cat if you are talking about a new recipe you tried out. 02 | Use large and high resolution photos. If you choose a super small or low res photo for your post, you might as well not use a photo at all. I like to use photos that extend the full width of my posts - I feel it's more visually appealing to have it lined up with my text. 03 | Justify your text. Most people align their text to the right. I think this is great for paper writing, etc. but as far as blogs go? It just looks so much cleaner to have two parallel lines running down the body of your text. 04 | Create paragraphs. If your post is short and sweet - perfect! People are lazy and don't like to read (sad, but true). For those of us (ahem, me) who feel like we have more to say, it's important to break your post into paragraphs. Think of each paragraph as a new thought. This enables people to skim your post quickly and get the main idea. 05 | Create headings or lists. Again, people are lazy and don't like to read. When you create headings or lists, it makes it easier for people to skim your post and still (hopefully) get the point you are trying to get across. 06 | Use spell check. It's easy to make mistakes. We all do it. (I do it all. the. time.) But that is why there are wonderful sources such as spell check. If you're lucky, your computer automatically catches every spelling mistake you make as you are typing! Thank goodness! If not, there are plenty of places to make sure you aren't making any major typos. 07 | Create a signature. This isn't something I use, but I generally like it when other people do. I think it is more practical for blogs that have more than one author so their readers can easily know who is responsible for the article. I used to have a signature but felt because it's just me here, people understood that I was the one signing off! (If you use Blogger, here is a super easy tutorial from Kevin & Amanda). 08 | Credit your sources. This doesn't really add to the visual appeal of your blog post, but it does add to the validity of it. If I got paid five cents for every time I read a post that not only used another person's photos but also credited their source back to PINTEREST, I would be a millionaire. Why on Earth people think it's OK to use photos from another person without sharing at LEAST the source (again, this does not mean Pinterest) is beyond me. So there you have it! Just a few tips you can utilize to make your reader's viewing experience more enjoyable! I justified my newest posts like you suggested. I've never tried that before and your posts are definitely easy on the eyes. Thanks for the tips. I'm always looking to improve.